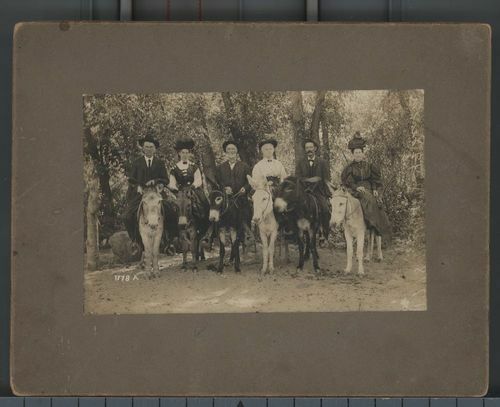 A photograph showing (left to right) Robert L. Carmichael (1850-1911), Sallie Ann (Taylor) Carmichael (1852-1936), Andrew Jackson Pickett (1846-1932), Amanda Melvina (Taylor) Pickett (1847-1922), James Glenn McKethen (1850-1942), and Hulda Amelia (Taylor) McKethen (1850-1930) on donkeys in Colorado Springs, Colorado. James Glenn and Hulda Amelia McKethen lived in Rexford, Kansas. They were vacationing in Colorado Springs, Colorado.